FUEL EFFICIENT 36 MPG Hwy/26 MPG City! SE trim. Bluetooth, CD Player, Brake Actuated Limited Slip Differential, iPod/MP3 Input, TRANSMISSION: 6-SPEED POWERSHIFT AUTO... Aluminum Wheels, Flex Fuel. CLICK NOW! Flex Fuel, iPod/MP3 Input, Bluetooth, CD Player, Aluminum Wheels, Brake Actuated Limited Slip Differential Rear Spoiler, MP3 Player, Keyless Entry, Child Safety Locks, Steering Wheel Controls. TRANSMISSION: 6-SPEED POWERSHIFT AUTOMATIC. Ford SE with Sterling Gray Metallic exterior and MEDIUM LIGHT STONE, CLOTH FRONT BUCKET SEATS -inc: 4-way manual driver, 2-way manual passenger and a interior features a 4 Cylinder Engine with 160 HP at 6500 RPM*. 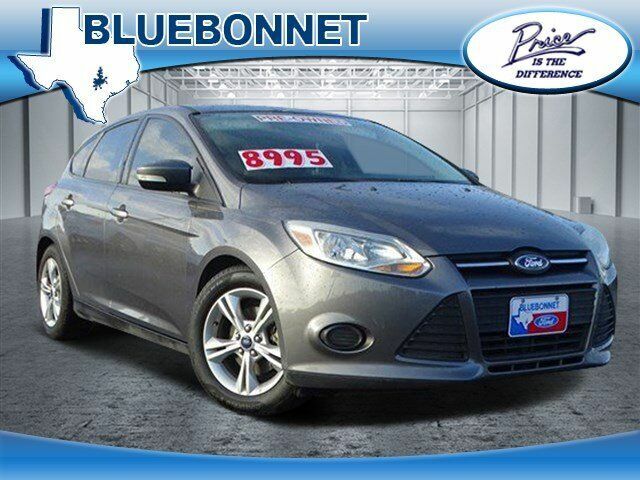 "Major reasons to consider the 2014 Ford Focus sedan and hatchback include sprightly performance, an upscale interior, a refined ride and excellent fuel economy." -Edmunds.com. Great Gas Mileage: 36 MPG Hwy.